The markets for goods and services have undergone significant changes over the past 20 years. Regulatory reform, global markets, new technologies and growth in the role of services in economic activity have driven the changes which, in many instances, have provided significant benefits to consumers. Relatively little attention has been paid to the challenges these developments have posed for consumers. More choice and more complexity in many markets have made it increasingly difficult for them to compare and assess the value of products and services. The challenges for consumers have raised similar challenges for the government authorities responsible for protecting them from unfair commercial practices and fraud.This book examines how markets have evolved and provides insights for improved consumer policy making. It explores, for the first time, how what we have learned through the study of behavioural economics is changing the way policy makers are addressing problems. 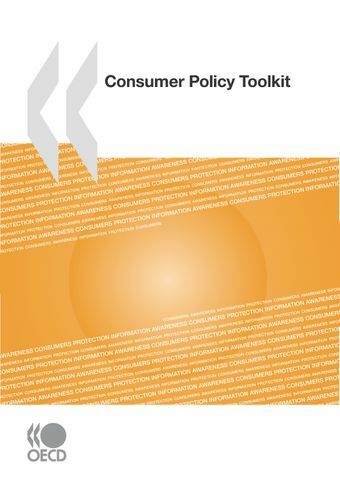 On 12 March 2014, the OECD Council adopted a Recommendation on Consumer Policy Decision Making, based on the framework presented in the Consumer Policy Toolkit, and the experiences that have been gained since the Toolkit was published in 2010. Read the news release. The OECD Consumer Policy Toolkit examines how markets have evolved and provides insights for improved consumer policy making. It explores, for the first time, how what we have learned through the study of behavioural economics is changing the way policy makers are addressing problems. The book will find its audience among consumer policy makers and academics. The Toolkit helps governments to eliminate barriers to competition by providing a method for identifying unnecessary restraints on market activities and developing alternative, less restrictive measures that still achieve government policy objectives. Policy instruments are being introduced and modified continuously by governments. Attached is a description of initiatives that have been taken by Mexico to promote and protect consumer interests. This report provides an account of the actions the 41 adhering governments have taken over the 12 months to June 2009 to enhance the contribution of the Guidelines to the improved functioning of the global economy. In nine years, the Guidelines have consolidated their position as one of the world's principal corporate responsibility instruments as recently acknowledged at the 2009 OECD Ministerial meeting and G8 l'Aquila Summit. This 2009 edition includes the results of the 2009 OECD Roundtable on Corporate Responsibility entitled "Consumer Empowerment and Responsible Business Conduct". Consumers today are challenged by growing amounts of information and Policy instrument update: Mexico (2011) wider choices of products, requiring them to develop skills and knowledge for making good choices in complex markets. This publication examines the approaches that governments use to promote consumer education in OECD and some non-OECD countries, highlighting the policies and measures that have been particularly effective. It also analyses recent trends, the role of stakeholders, steps being taken to evaluate the effectiveness of current programmes and the principal challenges. This report summarises the discussions of the second roundtable, held in October 2006, which again brought together academics and public officials concerned with market failures in markets where competition is deemed effective. It considered the economic theories of information disclosure and focussed on two major industry sectors – telecommunications and financial services. In addition, a proposed programme for further action, including the development of a “toolkit” to guide demand-side policy developments, was introduced. This report summarises the discussions held at a roundtable hosted by the CCP in October 2005. The roundtable brought together leading academics, senior government officials and consumer representatives from OECD member countries to explore developments in economic research, particularly behavioural economics, focusing on the role played by consumers in relation to the efficiency of markets. Recognising that policy makers have tended to analyse the structure of the market rather than the extent to which consumers' behaviour shapes its outcomes, the Committee explored the extent to which economists' studies of the demand-side of markets might be able to contribute further to consumer policy.